Wow how did u take this photo? This is really well done. Thanks for posting. I TRIED to give you 'Absolute Masterpiece' but the computer and I did not cooperate. WOW! What a shot! Impressionnant à défaut d'être beau le Typhon !!! I love aeroplanes and this picture sums up the energy, power and grace of a fighter plane. Sharp focus and blurred panned background add to the images impact. Beautiful. Fantastic capture, really great shot, love it! The photo was taken in the world famous, Mach Loop. The Mach Loop is a series of Valleys in Snowdonia National Park. "The Loop" or as it is known by crews from the United States Air Force, "The Roadabout", forms a small park of the Low Fly Areas in the United Kingdom. The opportunity happened mid afternoon on a cloudy/sunny day. The position that is known as Cad West and is at the base of the Cadair Idris mountain. In the morning if it's sunny the lighting can be very challenging as the sun is in your face till 1pm. On this occasion the only cloud in the sky covered the sun, so I used a shutter speed of 1/400th. My setup on this occasion used the Canon 50D and the Canon 100-400mm mk1 lens. 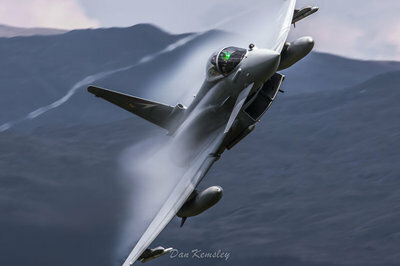 With the Mach Loop becoming more and more popular, it can be extremely difficult to get an image that is different. As a photographer I always try to be different and look for opportunities to do so. With moisture in the air, the jets were fluffing up loverly on a previous pass, so I waited for the Typhoon to start its bank to negotiate the Cad pass and then began to take a few frames. I mainly use Lightroom and on this particular photo, I used it to apply adjustments in contrast, shadows and sharpening. In my bag I have as stated previously, a Canon 50D, Canon 100-400 Lens, Canon 50mm f/1.8, Canon 17-40mm f/4, Manfrotto Tripod and a variety of Lee Filter products with a shutter release. When going to a popular place such as the Mach Loop. I often try and come out of comfort zone. Instead of using high shutter speeds between 1/1000th and 1/3200th, go the other way and go as low as 1/50th and no higher than 1/400th.